I blame the economic collapse at the start of the 21st century on ringtones. Once upon a time, musicians made music essentially through begging: they’d circulate through villages, and at the end of a performance would pass the hat for a meal, a coin or two, or a warm, dry bed. But in September 2009, it was estimated that 10% of the world music market was in the form of: ringtones. Consumers worldwide are spending real dollars not for live performances or complete works of music but, instead, 10 to 15 second snippets for their cell phones. This absurdity knows no bounds: I was recently approached by a panhandler who, just as he was about to make his pitch, was interrupted by Beyoncé’s “Single Ladies” announcing a call. Admittedly, not all the homeless and unemployed and starving have custom ringtones, or cell phones. But with hundreds of CDs around the house, virtually all of them now served out by iTunes, I felt no great need to buy ringtones. The Apple iPhone default ringtones are fine, but I need variety. This was made clear at a recent workplace meeting when someone’s iPhone rang and two-thirds of the attendees started frantically groping themselves. How to end the madness? While a number of “how to” guides have been published on how to turn an iTunes track into an iPhone ringtone, the process is not particularly easy. The steps are many, the software often obscure, and the results are uncertain. None of that applies to PocketMac’s RingtoneStudio 2. The window for RingtoneStudio 2 looks just like an iPhone. The directions on the opening screen leave no doubt as to what you should do next. Launch the application, and you see a window shaped like an iPhone. It is quite a bit larger – more the size of a trade paperback book -- but instead of a standard Mac application window, you see: an iPhone. The application downloads with no obvious documentation, and it turns out you don’t need any. The opening screen prompts you to “drag any of the following” types of files into the window to create a ringtone. If you have iTunes open, you can navigate to the track you want to use, click on the track name, and then drag it from iTunes directly to RingtoneStudio. 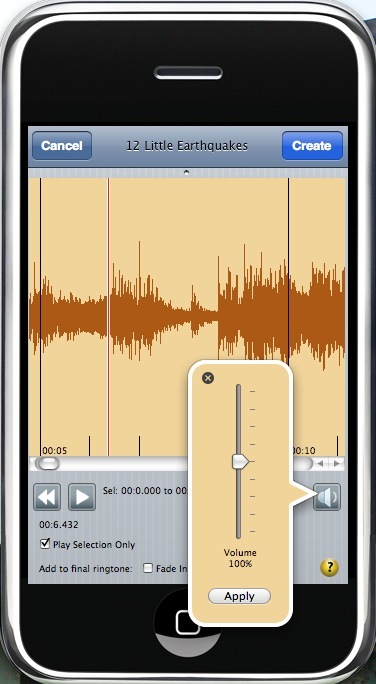 Once you’ve dragged your sound file over, RingtoneStudio displays the waveform of the sound on the “iPhone” screen, along with buttons for playing the sound and “rewinding” the sound. Another button allows you to set the volume of the sound; you can drop it to a fraction of the original or increase it to 200% of the original. Two checkboxes allow you to fade the sound in or out. 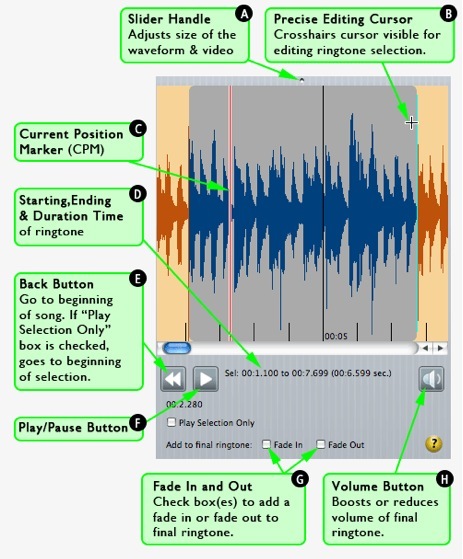 After dragging a file to RingtoneStudio 2, the screen changes to show the sound waveform and tools for playing, rewinding, selecting or modifying the sound. 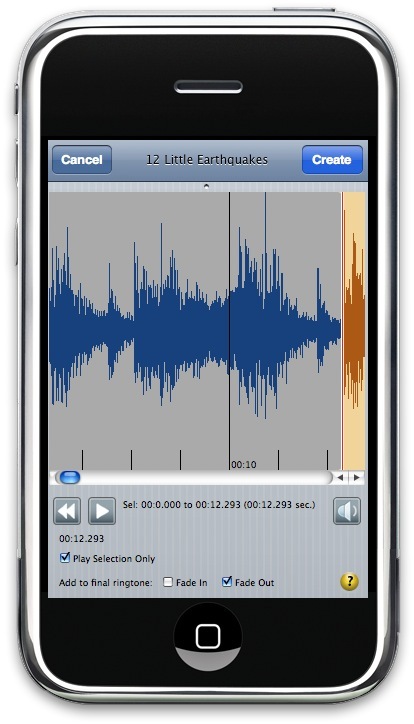 Drag across the waveform to select the part you want to use for the ringtone. You can easily make minor adjustments to mark exactly the part you want. If you happen to press on the question mark button, online help is displayed, but I managed to create several ringtones before taking the trouble to press the button. The RingtoneStudio interface is very Mac-like, and easy to use. There are, of course, the usual menu selections at the top of the screen, but you never need to use any of them. The View menu does offer one thing not found in the “iPhone” window: selections for zooming in or out of the waveform, allowing for extremely fine control over where a ringtone starts and ends. I never found it necessary to use them. Pressing the speaker button pops up a window that allows you to change the ringtone volume. The big button at the bottom of the “iPhone” screen clears whatever you are doing so you can start again, and the on-off switch at the top quits RingtoneStudio. These buttons aren’t documented anywhere, but they are nice flourishes. 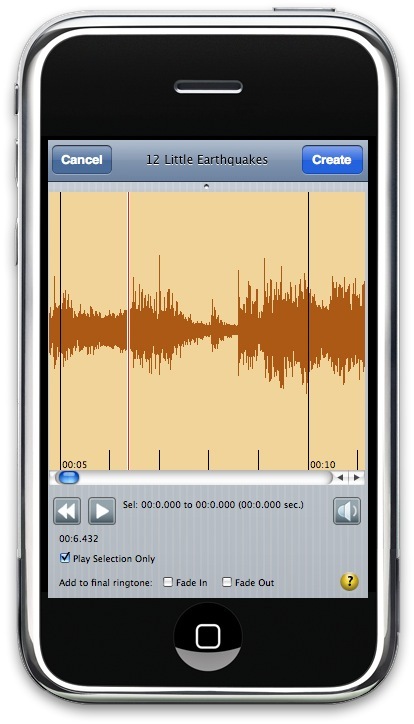 Select the part of the sound file you want to use as a ringtone by dragging across it. 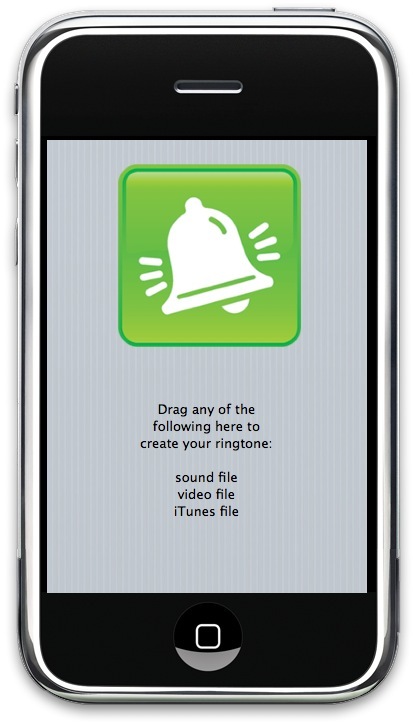 Once you have everything set just the way you want, press the Create button and RingtoneStudio creates the ringtone and automatically puts it in the Ringtone directory of iTunes. The ringtone has the same file name as the original music track, except that it adds the track number to the start of the name. I rename the tracks in iTunes to get rid of the track number and add “(ring)” to the end of the name, reducing the chance that I’ll mistake these snippets for the original music tracks. If you can’t live without documentation, pressing the question mark button brings up online help with several pages of documentation, including this handy guide to the controls. Syncing ringtones to the iPhone is done entirely in iTunes. Plug your iPhone into your Mac, fire up iTunes (it should launch automatically), select your iPhone, select the Ringtones tab, and sync all ringtones or selected ringtones. Ringtones are automatically copied to the Ringtones directory in iTunes. You can use iTunes to edit the file names to remove track numbers or add clues that the track is a ringtone instead of the original music track. Once the ringtones are on your iPhone, you can assign specific ringtones to individuals in your Contacts application. You can also change the standard ringtone for everyone else by going into Settings > Sounds > Ringtone and picking whatever suits your fancy. Sadly, you cannot change the default sounds for key clicks, Mail, or most other functions. Syncing ringtones to the iPhone is done entirely in iTunes. Select your iPhone, and select the ringtones you want synced in the Ringtones tab. PocketMac is best known for utilities that can sync data between the iPhone and various office applications (Entourage, Meeting Maker, Lotus Notes), or between various non-Apple smartphones and the Mac. Those utilities are undoubtedly useful, but if you want to add personality and a bit of whimsy to your iPhone, RingtoneStudio is certainly more fun.